After indulging in the Afghan food safari last weekend my wife was in the mood for something like the cottage cheese and spinach purée dish we had. The closest we have to that dish nearby is an Indian version. Not quite the same as it was always going to be more chilli oriented and less sweet than the Afghan take on it. None the less, we went with the Indian version anyway. I don’t eat Indian food all that often but when I do I find it to be a challenging task to match it to a wine considering just how powerfully spiced the food is. You often read of a wine that will go with “spicy” food but I find there’s so much range in what spicy food can be and it’s not so much the chilli aspects that need to be matched as it is the flavours that carry the spice. Thai, for example, with its citrus and coconut flavours is totally different to the dairy driven Indian. And Vietnamese is even more so citrus based. We discovered a couple of reds last week that went with Afghan but Afghan is subtly different to Indian and I wanted a white wine pairing this time. It was an unseasonably warm winters day at 23 degrees celsius so that was all the encouragement I needed to go white wine. It was calling out to me to start spring early. 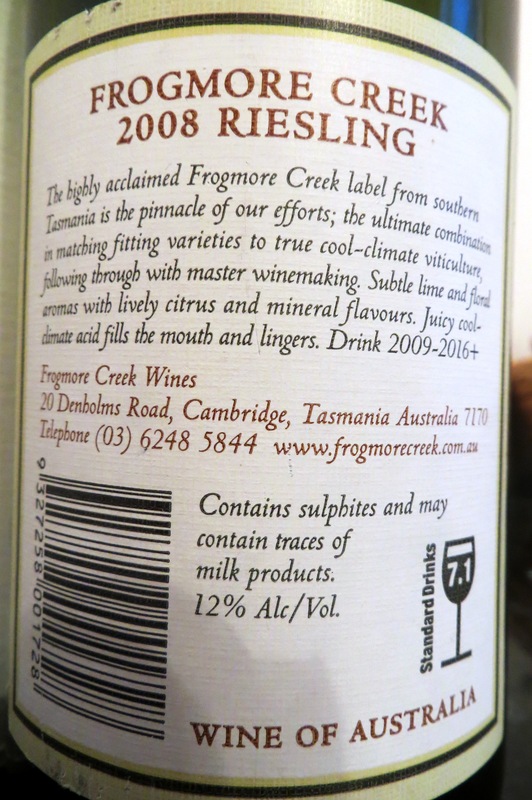 Reading the label of the 2008 Frogmore Creek Riesling told me that there would be subtle lime and floral aromas with lively citrus and mineral flavours. This wine is from southern Tasmania, a wine region getting noticed for its subtle cool climate Rieslings with delicate fruit concentration. Now I didn’t want a full and intense Riesling and I especially didn’t want much sweetness. That’s the sort of wine I’d like with Thai but I didn’t want that intensity with Indian. Although this wine label highlighted the citrus component it was the chance of subtlety and the mineral aspect that stood out to me. On opening I instantly got the lime and floral aromas. It was the sort of wine that attracted you from the outset. I did wonder though if it might be too intense because it was the scent of Riesling through and through. 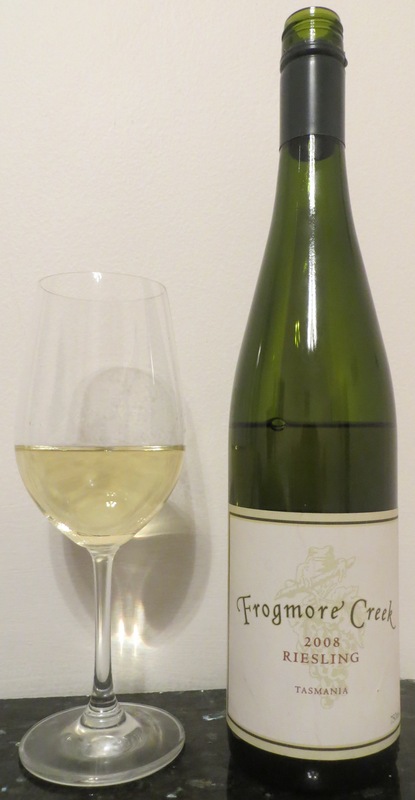 But on taking a sip I realised that this was indeed a subtle and gentle Riesling. Thankfully, there was not much sweetness to it but there was loads of apple and stone fruit in there, and a fine balance of fruit and acid to give it some decent length with a lingering vanilla and apple flavour. And hardly any hints of kero! It was definitely a finely focused and balanced subtle wine. Now, the test was whether or not it would go with the food. Frist up it was the tandoori lamb cutlets. Not overly chilli oriented at all, but with lots of spice. One sip. Perfect! The tandoori spices actually seemed to enhance both the fruit flavours and the vanilla finish. I was really not expecting it to work so well so I was pleasantly surprised. It was actually a really pleasant match. Next was the cottage cheese in a spinach purée, a hot chilli dish. This was the real test. And although not as enhancing as the tandoori lamb cutlet experience it was none the less a good match. The delicate fruit flavours held well against the chilli, probably due to the well balanced acid that was able to help the wine hold its own against the heat and spice. Definitely an enjoyable food and wine pairing. I agree! The acidity of Riesling is a great match with spicy foods. I’ll look for Frogmore. It sounds lovely. Nice one. Indian + a Tassie Riesling. Adding this Riesling to my ‘wine to try’ list!